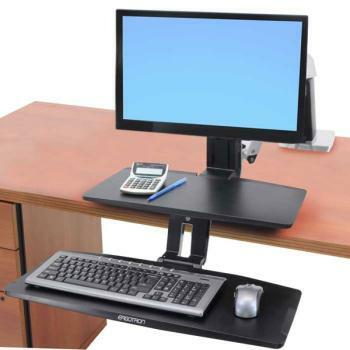 With WorkFit-A, convert any surface into a personalized stand-up desk. Modify existing office spaces or cubes by simply clamping the arm to the back or side of an existing surface, without the cost of expensive professional installers. When not in use, just fold up the WorkFit’s keyboard tray and swing the arm out of the way to free your desktop surface. 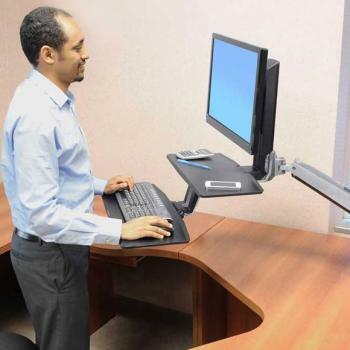 Enjoy standing or sitting as you work, switching positions whenever you choose. This work style encourages healthy movement throughout the day. Appreciate the creative freedom a WorkFit brings to your life. Not to mention the ways it can positively benefit your health, from burning extra calories to improving posture. This premium solution adds extra ergonomic benefits, allowing the keyboard tray to be positioned ≤ 4 inches below desktop level for optimum computing comfort. The large, single-piece keyboard tray accommodates most keyboards and mouse devices, and its 3° tilt helps wrists remain in a neutral position during data entry, preventing repetitive stress-injuries while increasing comfort. WorkFit operates without any levers, cranks or motors, meaning you won’t ever interrupt your workflow when you want to move. Its counter-balancing adjustment mechanism makes positioning simple, using patented CF technology that provides fluid, one-touch adjustments. Instantaneously place your keyboard and screen exactly where you want them, creating a personalized work experience. 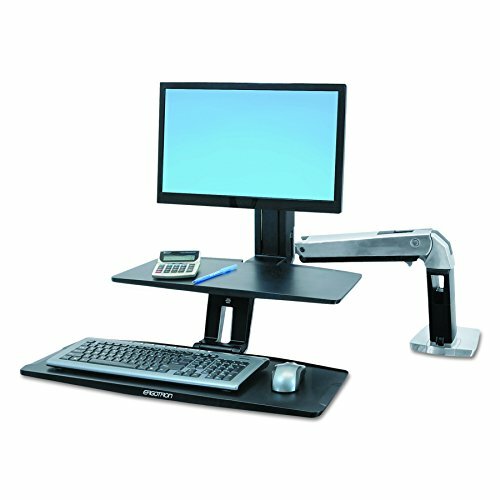 Features 20-inch height adjustment to allow working when sitting or standing, and can adapt to the heights of multiple users who may use a single workstation. This model is optimized to handle standard displays weighing 5 to 15 lbs. The display can be moved independently of the arm through a 5-inch vertical range to customize viewing. A supplementary worksurface is integrated into the unit for convenient placement of a tablet or notepad. Cable management routes and hides cords. The flexible, open-architecture design is scalable for future computer equipment. Recommended Screen Size: ≤ 24"
Height Adjustment: Display and keyboard adjust 20" in tandem; display adjusts independently another 5"
Keyboard Tray: 27" x 9.75"
Keyboard can be positioned below desk surface for ergonomic comfort.Keyboard Tray Dimensions:27.1inch W x 10.1 inch D.
On-demand sit-stand workstation. Improve your energy and productivity by standing or sitting as you work, and then switch positions whenever you choose.